Now you are all aware that NWG is not one to judge. She doesn't sit on some cushioned pedestal and look down on others. She certainly has no opinion on Shane Warne's little outburst on the field against Marlon Samuels last night (Shane - remember it's only a game, and the Big Bash at that - does it really matter that much? Oh wait, that's an opinion. Turns out NWG can't keep quiet). But what NWG really can't handle is annoying punctuation. Can anyone explain these exclamation marks? "I have decided to accept my penalty of a 1 match ban!" He tweets. "I went to far in trying to stand up for the team !" "I'm disappointed at some of my actions last night as captain & as a player, but I'm also very disappointed at the severe penalty I received!" Well look who it is? You know I always harboured a hope you'd return, hence the occasional visit to the blog. The least I thought you'd do on your return is let me know....but no, too precious for that aren't you? You disappoint me, Mare, and it takes a special kind of nasty piece of work to disappoint Stani. And a boyfriend? Disgusting. Next you'll be telling me you breathe, eat and sleep like the rest of us. Oh Stani! How NWG is glad to hear from you. No more sad music. NWG hopes she can still be friends. Maybe I'm still a little disappointed from the fact that Marlon did not connect with the bat, Mare. 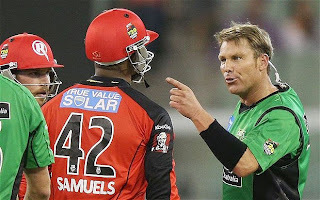 Aggressive behavior is the part of Australian cricket, all Australian cricketers use aggression either they are in batting side or bowling side. Here Shane Warne representing his national cricket team behavior. I am sure they will manage to be friends. I am a Cricketer fan, and i watch this. In pavilion everything becomes normal. Cricket is a game where you come in Aggression. thanks fro the information.keep shairng.